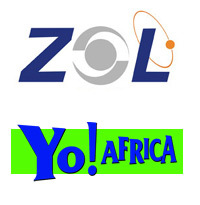 Today, ZOL and Yo Africa, two of Zimbabwe’s biggest ISPs, have announced that they have entered a “strategic alliance” in which the two ISPs will combine some operating resources to lower the costs of service delivery. The scope of resources the two ISPs will share in this alliance is not very clear but there are indications this involves bulk purchases of International bandwidth capacity from Internet Access Providers. Since a few days before the end of the 2011, a rumour about a possible ZOL and Yo Africa merger has been doing the rounds in Harare. Some speculators even went further to throw WiMax provider, Aquiva, in the deal mix. The announcement today clears things up. There’s no merger to talk about. We had an opportunity to speak to ZOL Founder and CEO, David Behr, and he confirmed to us that the two ISPs remain separate entities in this “strategic alliance”. He also revealed that ZOL and Yo Africa are currently talking to Aquiva for some bulk internet deals, but this in the same fashion they would with any IAP. We also managed to solicit a comment from Yo Africa co-founder and director, Mark Kalweit, who said the alliance was part of an effort by the two ISPs to explore ways to enhance services to customers. Aquiva has generally confirmed the bulk deals, elaborating that ZOL and Yo Africa have secured Indefeasible Rights of Use (IRUs) for some of Aquiva’s WiMax infrastructure. On what lies ahead, ZOL and Yo Africa say they hope to find ways to maximize Zimbabwe’s telecommunications’ infrastructure to avoid infrastructure duplication and to efficiently use incoming investment to the country. They two also confirmed they are seeking further strategic alliances with IAPs to improve service delivery. It’s not too hard has to see that the “strategic alliance” between ZOL and Yo Africa will make competition a bit uneasy. There are no official figures available but ZOL is arguably the biggest ISP in Zimbabwe. Yo Africa is generally up there too. And you will remember also that ZOL has the widest WiFi hotspot coverage in Zimbabwe. Yo Africa is in this business too with its Chilli-Spots. lets hope this makes access to internet cheaper and more reliable for ordinary folks. Still on the subject, how “fast” is internet in Harare? Does ADSL exist or its still dial-up and now 3G? this is just talk and no action. we saw the merger btwn africaonline and mweb. what has come out of that merger, NOTHING. so who says this so called strategic alliance will bring something for the people.